Figure 62. A cross-bow bottle devised by Jean Comelli, instrument-maker of the Oceanographic Museum at Monaco in 1953. 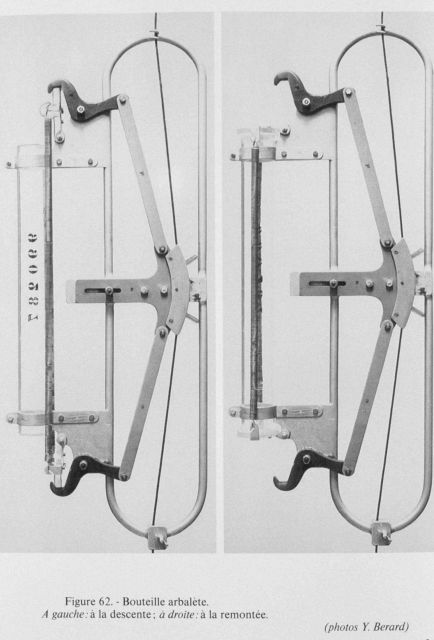 This instrument was built for Jean Brouardel for studying oxygen content in sea-water. The bottle is plexiglass. Left: descending. Right: ascending. This instrument was used on the museum’s small vessel the EIDER off Monace in depths of 150 to 500 meters.